If you're outfitting a kitchen fit for a home cook, look no further than the KitchenAid® Smart Oven+ with Powered Attachments. This new product won a CES® Innovation Award in the Smart Home product category in January. 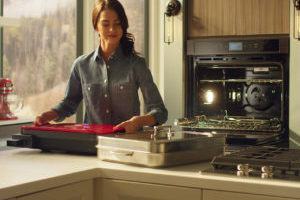 It features three interchangeable, oven-powered attachments that expand the creative horizons of a wall oven to include grilling, baking and steaming within one appliance.